So, the question is: how to be less irritating? Consider how you feel when a fellow cyclist approaches you will full beam straight ahead. It's pretty blinding, even for a moment, and especially off-road when your eyes aren't used to it. Dim your light to its lowest setting (within reason). Put it on steady beam. Flashing is more visible but also more annoying and disorientating. Physically push it forwards/downwards so it's pointing towards the ground, not into anyone's face. If you do this then it doesn't matter whether you illuminate pedestrians or for how long. 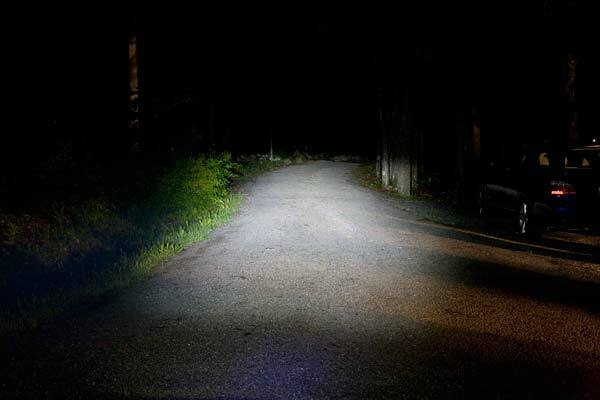 There are now many bike lights on the market which have a shaped beam with a "horizontal cutoff" giving strong light onto the road or path, but much less above the horizon. When adjusted correctly these allow you to see where you're going without dazzling oncoming traffic or pedestrians. 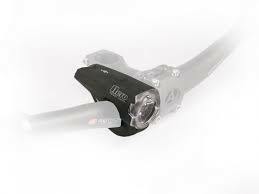 I use a Busch & Muller Ixon IQ (pictured), but there are others. If you don't want to fork out for a new light, you can make a hood for the light to block the light from going upwards. I had to face exactly this on an old commute. Dipping the front light was absolutely necessary in a park and another stretch of unlit bike path. It was a bright enough light to illuminate the road, though not well enough to ride at any decent rate on low power. The solution I found to this was to add a narrow-beam head torch. This can be dipped hands free, and points where you look rather than where the bars are pointing (quite useful when it's pitch dark and you're next to a lake going round sharp bends). Overhanging branches can mean the need to illuminate stuff that's not the road surface, so I tended to adjust the light as I rode much as you'd switch from main beams to dipped beams in a car. 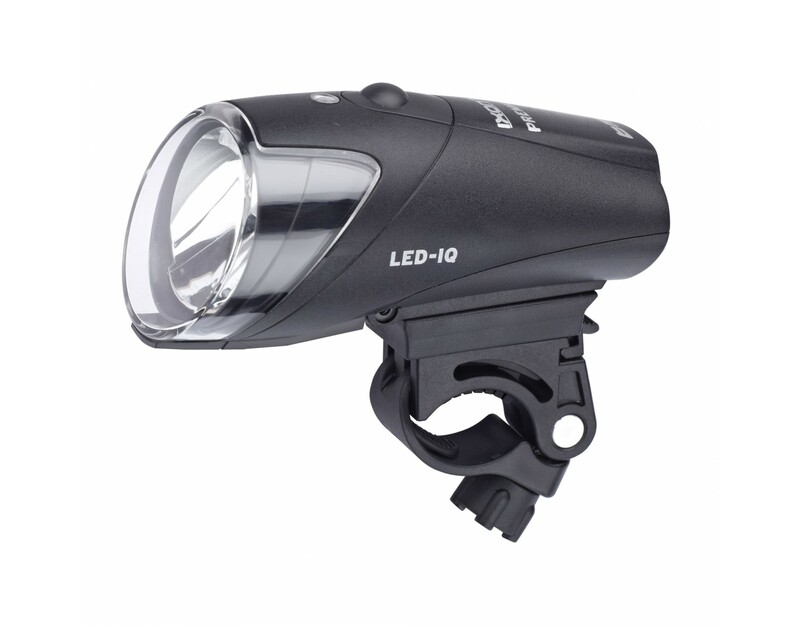 The head torch I bought was ~5 from dealextreme, and is 150 lumens nominal -- so not very much ligfht in total. But all that light is in a bike-sized area of road even if it's directed 10 bike lengths away. I tended to adjust the angle such that I had to tip my head slightly up to illuminate as far away as I'd like for ~30km/h speeds on imperfect tarmac, so that a natural head position was more suited to slower speeds with other people around. In busy areas well-lit I could easily point it almost straight down. You can dip the light slightly (point it towards the ground). Even without considering politeness, you might prefer to illuminate the ground ahead of you, instead of (as you would on a lit city street) pointing it straight forward to be seen as maximum distance. In case you can read German, here's a nice explanation how to adjust the bike front light. make sure that the upper rim of the light at 5m distance (wall) is below that height. I wear an adjustable head strap flashlight at night while riding my bike. The one I have has three colors (white, red and green)which allows me to use a less intense color at times, so as not to blind people. As an addition to three colors, of has three level of intensity. It is worth looking into. With this you are able to turn your head slightly when needed. These examples may be of help to you. The one pictured is the style I use at the moment. Not the answer you're looking for? Browse other questions tagged lighting etiquette night-riding or ask your own question. Is there a polite way to take the centre of the road without antagonizing motorists? Is it bad etiquette to ride road bike through a small residential area?